Robert Anderssen was born on the Black Friday ‘ Friday the 13th ‘ in 1939 in Brisbane, Queensland and was educated at schools around Queensland, in Tingalpa, Wynnum North, Bundaberg North, Maryborough and Charters Towers. 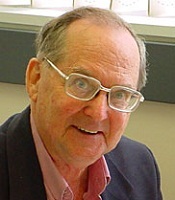 He obtained a BSc (Hons) in 1960 and an MSc in Mathematics in 1965 both from the University of Queensland, Brisbane and a PhD in Mathematics in 1967 from the University of Adelaide. Positions held include Lecturer in mathematics at Monash University, Melbourne, Research Fellow, Fellow and Senior Fellow in computational mathematics and modelling at the Australian National University, Canberra in the Australian Capital Territory and Senior Principal Mathematician at CSIRO. Being a mathematical modeller in CSIRO is a challenge and a pleasure. There is a never ending list of new applications that yield new perspectives about established mathematics as well as requiring the generation of entirely new structure. The biggest challenge is the conceptualisation of the essence of the problem to the point where a pattern is exposed which can be modelled mathematically. to work on the equations that describe wheat-flour dough rheology ‘ the elastic flow and deformation of dough ‘ to improve the efficiency of mixing wheat-flour dough to make bread and to derive molecular information for the more efficient breeding of new varieties of wheat. working on the equations that describe dough rheology, basically the ‘stretchiness’ of dough, to improve the efficiency of mixing wheat-flour dough to make bread. Bob Anderssen is promoting maths to a new generation by contributing to the production of the CSIRO and Australian Mathematical Sciences Institute newsletter, Maths by Email. He advises on maths topics and assists the editors with checking their maths facts.